MILWAUKEE — Any thought the Chicago Cubs may have had about possibly knocking the Milwaukee Brewers out of the NL Central race have all but gone out the window. 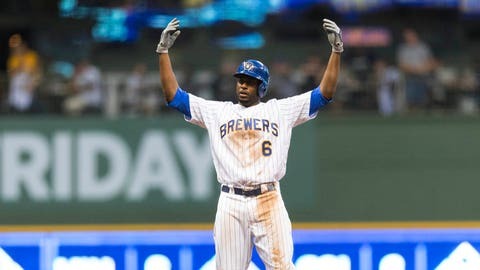 After taking the first two games of a critical three-game set at Miller Park this week, the Brewers closed to within three games of the division lead and could climb within two if they can finish off the sweep Wednesday night. The Brewers have won six of their last seven games, 11 of their last 15 and five straight series as they moved to 18 games above. 500 for the fourth time this season — and the first time since July 10, when they were 55-37. But Milwaukee has also turned the tables on its division rival, winning five of the last six meetings after dropping eight of the first nine this season. The Cubs will try and get back on track behind left-hander Jose Quintana (11-9, 4.21 ERA), who’s 2-1 with a 2.63 ERA in four starts against the Brewers this season but was knocked around the last time he faced Milwaukee, allowing five runs on six hits in five innings of a 7-0 loss at Wrigley Field last month. Quintana has allowed four total runs since, spanning three starts, including only one over six innings of three-hit ball his last time out against Philadelphia. “In the last month, everyone is locked in,” said Quintana, who is 4-2 with a 1.67 ERA in eight career starts versus Milwaukee. The Brewers hand the ball to their most reliable starter this season in right-hander Jhoulys Chacin (14-5, 3.53 ERA). Chacin faced off against Quintana in that meeting last month and produced a gem by striking out a season-high 10 over seven scoreless innings — his second shutout effort against the Cubs this season. “They’ve been the team to beat the last three years, and it’s always good to beat them,” said Chacin, who is 4-4 with a 2.84 in nine games (eight starts) versus Chicago. Cubs manager Joe Maddon said he expects to have first baseman Anthony Rizzo in the lineup for the series finale. Rizzo left Tuesday’s game after fouling a ball off his foot during his second at-bat. X-rays did not show sign of a fracture.